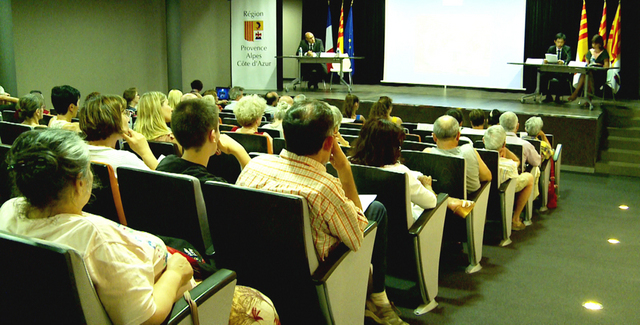 A seminar was held by Marseille Amnesty International, the Action by Christians for the Abolition of Torture, and the Chinese Friends Association, to expose the Chinese Communist regime’s persecution of individuals, groups, and minorities, especially Falun Gong, in Marseille, the second largest city in France, on June 30, 2012. 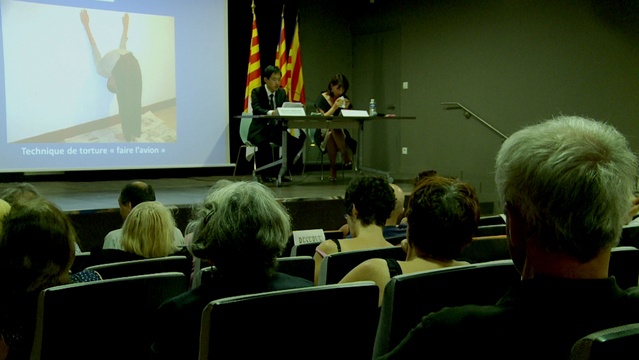 Mr. Wang Zhe, a Falun Gong practitioner who had just managed to flee from China to France earlier this year, gave a presentation at the meeting. He had witnessed cruel torture by the CCP through his personal experience. Some in the audience were moved to tears. Organizations including Marseille Amnesty International, Action by Christians for the Abolition of Torture, and the Chinese Friends Association expose the Chinese Communist Party's (CCP) persecution of Falun Gong to the public. 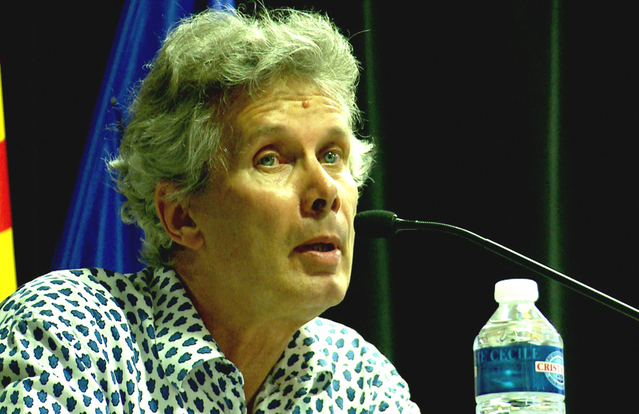 Mr. Gerald, on behalf of Marseille Amnesty International, stated that Falun Gong is a mind-body practice, which attracted many Chinese people in China in the 1990s. But in July 1999 the Chinese Communist regime began persecuting Falun Gong practitioners. The Chinese Communist Party exerted nationwide and systematic violence against Falun Gong. Mr. Gerald pointed out that according to the Chinese Constitution, Chinese citizens have freedom of belief, speech, and assembly. Mr. Gerald emphasized that the Chinese government should respect its own Constitution as in Article No. 36: The citizens of the People's Republic of China have the right to enjoy freedom of religious belief. None of governmental and social organizations and individuals can compel citizens to believe or disbelieve in religion, or discriminate against religious citizens or non-religious citizens. Mr. Gerard said that in 1988 the CCP regime signed and was approved to join the United Nations Convention Against Torture, which was referred to as the Convention against Torture and Other Cruel, Inhuman, or Degrading Treatment or Punishment. He said that torture and ill-treatment still remains prevalent in China, and the Falun Gong group had collected much evidence of practitioners being tortured, abused, and even threatened to death by unlawful detention. According to informed sources, one Falun Gong practitioner every three days is tortured to death by the regime. Obviously, the CCP regime is in violation of this Convention and openly violates the law. 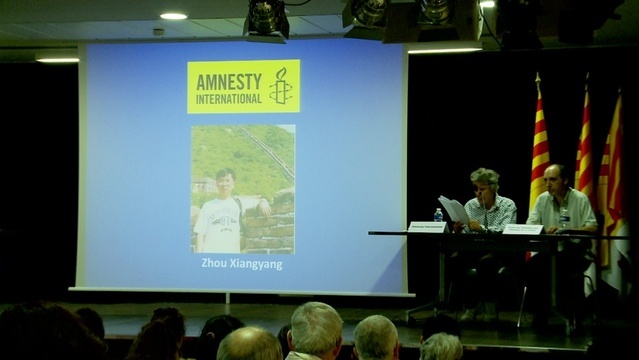 Amnesty International representative presents the story of Mr. Zhou Xiangyang, a Falun Gong practitioner abducted by the CCP regime. Finally, Mr. Gerald introduced the story of Mr. Zhou Xiangyang, a Falun Gong practitioner arrested by the CCP regime last year. He had been unlawfully imprisoned for more than nine years, during which time he was subjected to various forms of torture, including electric shock, sleep deprivation, beatings, and forced labor. The regime continued to deny his right to counsel. After the appeal initiated by his wife Li Shanshan, more than 2,500 people in his hometown signed a petition calling for his release. Wang Zhe, a Falun Gong practitioner from China, told the audience about his personal experiences, including how he benefited from the practice of Falun Gong and how he was tortured by the CCP. He said that in 1997, before he started to practice Falun Gong, he got a contagious skin disease when he was working in a hotel. The disease disappeared within a week after he began practising Falun Gong. Mr. Wang Zhe was subjected to a torture called "flying an aeroplane" in a labour camp in China. After the persecution began in 1999, Wang Zhe was arrested for handing out a Falun Gong information CD about the CCP-staged Tiananmen Square self-immolation incident. In the labour camp he subjected to a torture called "flying an aeroplane" - hands stretched to the back above the body with head bowed against the wall. It was in the No. 3 Squadron of Shuangkou Labour Camp in Tianjin that he was forced to work at least fifteen hours per day. In addition, he was forced to reflect on “his crimes” every night after work. As a result he could only sleep for two to three hours a day. Wang Zhe described a case of torture he witnessed, "There was an elderly man named Baoliang Chen in the labour camp. He was a Falun Gong practitioner. One day he stood out to stop the camp guard from beating other people in the camp. He was consequently assaulted by some people in the detention centre, which was instigated by guards Meng Zhaosheng, Wang Kui, and Li Hua. Moreover they tied Baoliang up with his hands behind him, and sealed his mouth with tape. When he was knocked to the ground, detainee Guoliang Wu jumped up to brutally kick Baoliang’s chest. Eventually, the kind-hearted elderly practitioner was cruelly tortured to death. Yet guard Meng Zhaosheng lied to Baoliang’s family, saying that he died of a sudden heart attack." "I was later transferred to the No. 7 Brigade in the Qinbowa Forced Labour Camp. There was a full house of drug addicts, and a few Falun Gong practitioners. It was a very ugly place where drugs were still available. The prison guards were busy making money by helping drug deliveries to the drug addicts inside. The steamed buns we ate had rat droppings in them. The cabbage soup was full of bugs. The guards tested their electric batons with pigs. They found that the concurrent use of four electric batons could kill a pig. But often they used six to eight electric batons to shock a Falun Gong practitioner. "Beginning in January 2003, they reserved a whole floor of a building where Falun Gong practitioners were forced to renounce their belief, four at a time. After a month of hunger strike as a protest, I was sent to the "transformation" room, where I was knocked to the ground. Six people stood on my limbs and body, torturing me with six electric batons, shocking my sensitive parts, such as the palms, soles of the feet, neck, and mouth. All my senses were gone. During that time the entire corridor was filled with the smell of human flesh burned by the electric batons, and the snapping sound of the electric shocks. I was very weak, and had a large pustule on my back after days of torture. I was tortured to my mental and physical limits. In June 2003, I was diagnosed with tuberculosis, and released on medical parole. Unfortunately my health got worse after I returned home. The pustule on my back grew bigger and bigger, and finally my spine was fully covered by the pustule. As a result I was diagnosed with spinal stenosis. Yet the pustule continued to grow up to my neck, which resulted in my becoming a paraplegic in July 2005. Due to years of persecution, my family couldn’t afford the medical treatment for me. But my belief in Falun Dafa was unshakable. I kept up with Falun Gong exercises, and regained my good health soon." 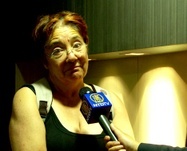 Martha, a former kindergarten principal, was moved to tears. Meanwhile, in the hall, a one-week exhibition of "Falun Gong being persecuted in China" was held by the Amnesty International. 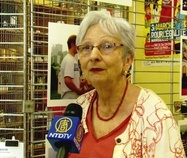 Rita, a representative of Amnesty International, stated that it was intolerant that such a kind and peaceful group of Falun Gong practitioners in China is being brutally persecuted. 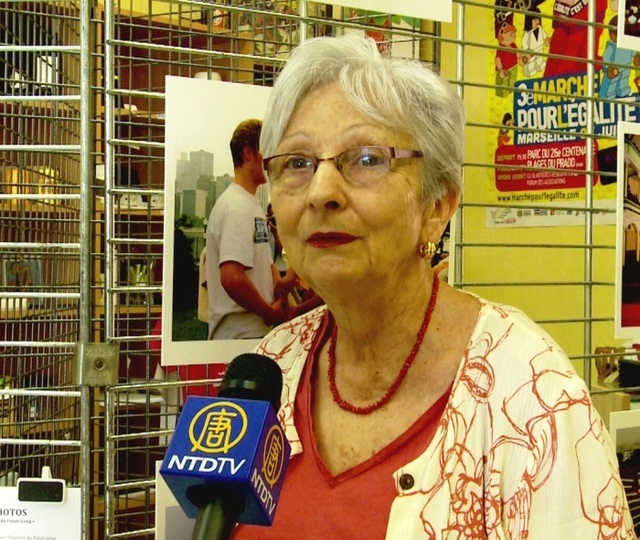 She pointed out that some unbearable pictures shown in the exhibition made her truly believe that something must be done to condemn the persecution in China. The priority is to have a joint effort around the world to end the CCP’s unlawful and inhumane persecution of Falun Gong practitioners.